The holidays have officially arrived, and I’m in the mood for something both naughty and nice! Create a sweet or savory baked good featuring one or more of the following seasonal ingredients: Pumpkin. Whether you’re a devotee of French patisserie or you’ve got a healthy spin on baking, show us your best baked good and tell us what inspired you to create it. Healthy spin on baking … I think not! 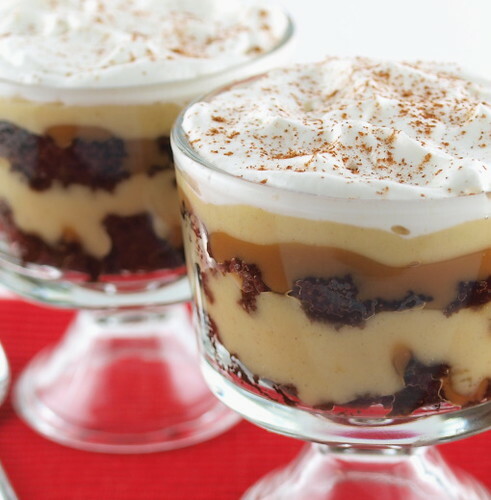 Tis’ the season for giving generously, indulging with abandon, and spreading good cheer, and I can do all three of those things with my Gingerbread, Pumpkin, and Sticky Toffee Trifle. 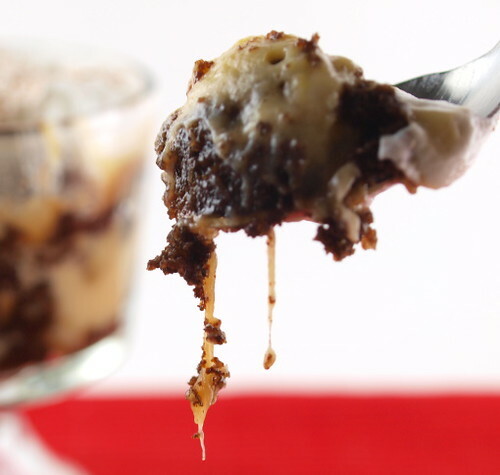 This recipe combines three of my holiday loves – cake, custard, and candy. I will be frank with you when I say my shenanigans tend to take a decidedly evil turn toward the end of the year. With that in mind, I see no reason not to take all three of my most beloved treats and combine then into one dessert. So, that is what I did. One bite was all it took to prove it was the right thing to do. As stated above, the challenge is to create a baked item that features pumpkin, so let me tell you how I accomplished my mission. First, there is pumpkin in the custard. 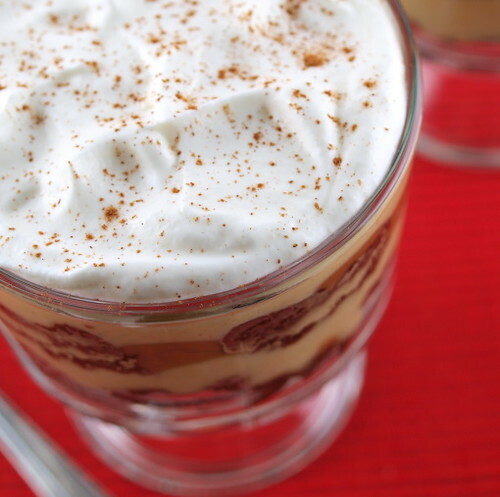 It features my own fresh pumpkin puree and is spiked with some dark rum and cinnamon to add some seasonal warmth. It is reminiscent of pumpkin pie, but smoother and much more delicate. My pumpkin puree also found its way into the chocolate gingerbread cake. Pumpkin puree is wonderful in chocolate or spiced cakes to keep them tender and moist. 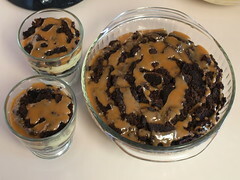 There is no pumpkin in my sticky toffee sauce, but the oozing caramel adds to the overall voluptuousness of the trifle. Topped with a cloud of fluffy whipped cream it is a symphony of sin, but it tastes so nice no one will resist. Heat the oven to 350 F and spray a 9″ x 13″ pan with non-stick cooking spray. 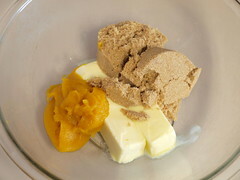 In a large bowl cream together them sugar, butter, and pumpkin until light and fluffy. Add the eggs one at a time beating well after each addition. 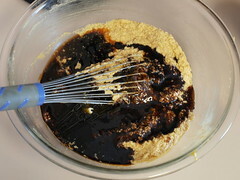 Add the molasses, golden syrup, vanilla, and fresh ginger and whisk to combine. 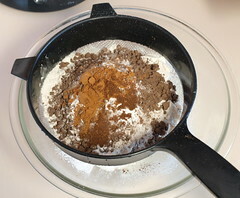 In a medium bowl sift together the flour, cocoa powder, salt, and spices. Add the dry ingredients into the butter mixture alternately with the hot water, starting and ending with the flour. 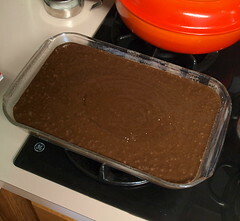 Pour the batter into the prepared pan and bake for 35 to 45 minutes, or until the cake springs back when lightly pressed in the center, and the edges are starting to come away from the sides of the pan. 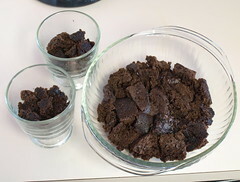 Cool completely in the pan then cut into 1″ cubes. 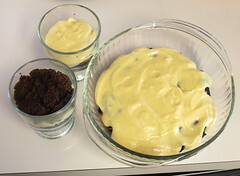 While the cake cools prepare the custard. 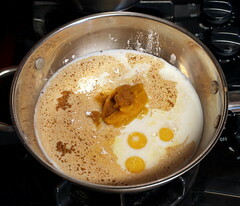 In a medium pot whisk together the milk, egg yolks, sugar, cornstarch, cinnamon, salt, and pumpkin. Cook over medium heat, whisking constantly, until the mixture just comes to the boil. Remove the pan from the heat and whisk in the vanilla, butter, and rum. Pour the custard through a fine strainer into a bowl and press cling film directly on the surface of the custard. Chill for at least one hour. While the cake and custard cool prepare the sticky toffee sauce. 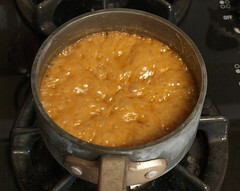 In a 2-quart sauce pan over medium heat combine the brown sugar, butter, and golden syrup. Cook until it comes to a boil, about 5 minutes. Carefully add the vanilla and cook for one minute more. 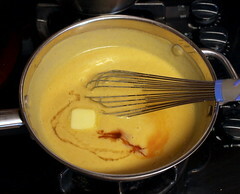 Remove the pot from the heat and carefully whisk in the cream. Cool the sauce until it is just warm. To assemble the trifle begin by whipping the cream. In a large bowl combine the cream, vanilla, and powdered sugar. 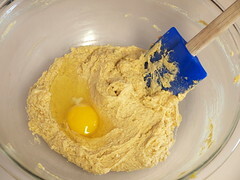 Whip until the mixture forms soft peaks. 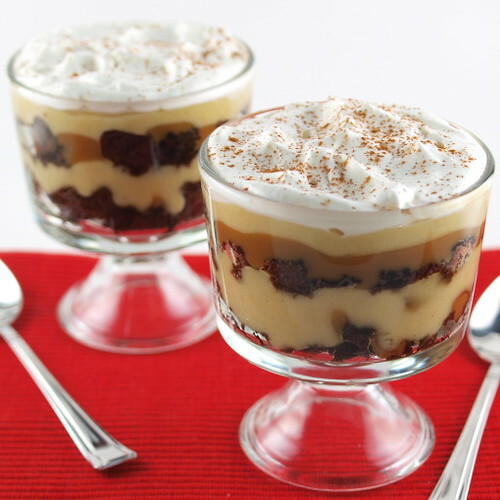 In a large trifle bowl, or in smaller individual bowls, add a layer of cake (you will use 1/3 to 1/2 the cake), drizzle over half the toffee sauce, and spread over half the pumpkin custard. 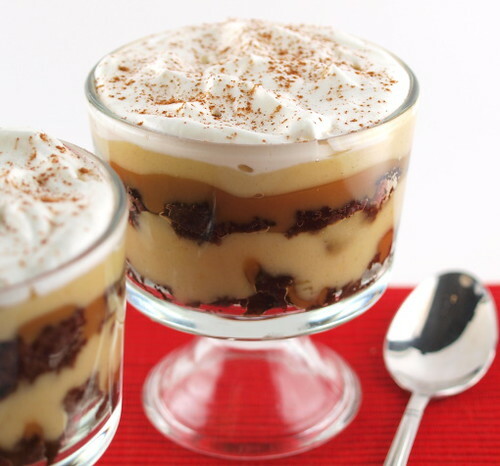 Repeat and top with whipped cream. Chill the assembled trifle for at least four hours, or overnight. Spread some holiday cheer … enjoy!